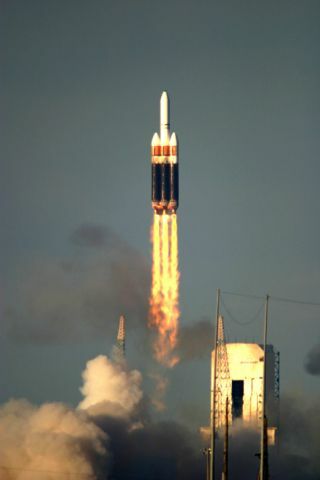 Boeing's first Delta 4-Heavy rocket lifted off from Cape Canaveral on Dec. 21, 2004. CAPE CANAVERAL, Fla. - Investigators are theorizing that the flow of super-cold liquid oxygen in the three core boosters of Boeing's first Delta 4-Heavy rocket could have been disturbed, creating "bubbles" that tricked internal sensors into thinking the motors were out of fuel and causing them to command a premature engine shutdown, the Air Force said Friday. The heavy-lift rocket, topped with a instrumented satellite mockup, was launched from Cape Canaveral December 21 on a test flight for the U.S. military. The mission's goal was demonstrating the vehicle's capabilities and identifying any problems before actual national security payloads are entrusted to the rocket. The Delta 4-Heavy features three Common Booster Cores (CBCs) strapped together to provide 1.9-million pounds of thrust at liftoff. The Rocketdyne RS-68 main engine on each booster consumes liquid hydrogen and liquid oxygen. During the ascent, the outer two boosters shut down their engines and separated eight seconds early after sensing the fuel supply in each stage had been depleted. The center booster had its firing cut nine seconds short by the same problem. Sensors temporarily indicated "dry" fuel conditions despite the stages having plenty of propellant remaining to accomplish the scheduled firing time. The sensors returned to "wet" readings after the shutdown sequence was activated on each booster. "An Anomaly Investigation Team of engineers from the Boeing Company and the Air Force, supported by the Aerospace Corporation, has not yet determined the root cause of the premature shutdown as it continues its disciplined process of evaluating the flight data," the Air Force said in a statement Friday. "The leading candidate is some type of disturbance of the flow of liquid oxygen in the area of the engine cutoff sensors. The liquid oxygen flow conditions appear to be very similar in each of the CBCs at the time of premature engine cutoff commands, which further supports the assessment that the problem was common to all three Heavy demonstration boosters. "A subteam of Air Force and industry experts is constructing computer simulations of the liquid oxygen flow between the bottom of the propellant tank, and the engine cutoff sensors, approximately five feet downstream. "The investigation team will assess whether the design of the liquid oxygen feed system could be creating a cavitation (localized change from liquid to vapor) under the flow conditions unique to the Heavy demonstration mission. If so, these cavitation 'bubbles' could have signaled a change from 'wet' to 'dry' by the engine cutoff sensors, triggering the premature shutdown sequence. "The investigation goal is to understand this premature shutdown, and to correct any deficiencies and mitigate risk prior to flying an operational mission. Possible mitigations will be examined once the investigation team has determined the root cause. Although there have been reports in the media that Boeing and the Air Force will make software and timing changes in the design, specific corrective actions have not yet been chosen." The early engine shutdowns left the Delta rocket's upper stage and attached payload traveling much slower than planned. Although the upper stage fought to make up the lost ground by firing its engine longer, the motor ran out of fuel and reached a final orbit 10,000 miles lower than targeted. "This was the first flight of the Delta 4 HLV, the largest rocket ever in the Air Force arsenal. A Senior Review Team, chartered by the Under Secretary of the Air Force deemed this the greatest technological launch challenge since the first space shuttle," the Air Force statement noted. "Because of the challenges, the Air Force teamed with the Boeing Company to make this first flight a demonstration. As part of the demonstration, the Delta 4 HLV carried a dummy payload (Demosat)." A formal post-flight review of the launch data is scheduled for late-January, the Air Force said. "We collected an unprecedented amount of data that we're thoroughly analyzing to reduce risk and fine-tune our plan for the first operational Heavy mission," said Col. John Insprucker, Evolved Expendable Launch Vehicle Program Director, Space and Missile Systems Center, and the Air Force mission director for the demonstration launch.